Bryn had the most liked content! Blues, rock 'n roll, rock, heavy metal and much more. Stuck here with my keyboard in front of me - but it's warm here! Speedway plus Bundy and coke and warm weather - I'm allergic to cold and also to mornings! Wales beating England at... mmmm let me think.... ah yes...... anything! 'The Voice of Reason' lives in Warwickshire I believe and, as the situation has been explained to me although I've no way of guaranteeing its accuracy, whilst I and no doubt you believe he is fully entitled to hold his views and express them as he has done on this and every other forum provided they are not libellous, it has been patently obvious for some time that he dislikes Jon Cook immensely since he was told his services as a member of the trackstaff were no longer required at Purfleet. Whether that was prior to him moving to Warwickshire I really don't know. What I DO know is that it was down to postings of a constant negative nature from him and others that led to the original forum being put into 'maintenance mode' i.e. effectively shut. Nobody in their right mind would object to receiving criticism, in fact most would welcome it, PROVIDED it was of a constructive nature. Go to the forum address "The Voice of Reason" has given you, see how many of the 43 members (last time I looked) post on it and see for yourselves. "E I Addio" has! Every season since 1966 when I went to my first ever meeting at West Ham. This thread is about what people would like to see coming out of this year's British Speedway Promoters Association AGM and has little to do with the current Grand Prix system other than with there having been a dozen rounds this year, it has severely hit notions of running Elite League speedway regularly on a Saturday night. I have my own views on what I personally feel is now what I'd describe as a travelling circus but that's for another time. In your original response to the question posed in this thread's title you stated, "Better referees" and now you try and justify that by firstly comparing it to soccer which, let's face it, is now more or less a non-tackle sport infested with prima donnas who must train hard to perfect their standing jump up in the air and spectacular fall to earth with umpteen twists any time member of the opposition comes anywhere near them looking for the ball - how long would the likes of Norman 'Bites Yer Legs' Hunter lasted in many modern day game before being red carded? And secondly stating that you could do a better job. Anyway when announcing at meetings I've sat alongside the vast majority of current British speedway refs at venues in all three leagues and they don't get replays over and over and over as you seem to think, basically they get NO replays and make their decisions on what they've seen from their fixed position behind the controls. Supporters of a particular team are bound to question decisions that go against them AND agree with decisions that go in their favour. You've stated you could do a better job than current referees - why not take steps towards proving it? So do I take it then that you're going to apply to become a referee "GiveusaB?" Are you volunteering to be one then? I posted under that pseudonym of "The Welshman" as a guest on a couple of occasions "Midlands Supporters Club," purely and simply because to post under the name of Bryn apparently I would have to rejoin the unofficial supposed "fans" forum, something I wasn't prepared to do to swell the membership to 43, a great many of whom (not least yourself) openly admit you don't attend the club's meetings and do nothing but decry it. Your determination to have a go at Jon Cook under the pseudonym of "The Voice of Reason" on this forum on a regular basis in addition to you doing the same under a different pseudonym elsewhere has, for a long time now, obviously been something of an obsession you sadly suffer from. Whatever 'floats your boat' I suppose, but your postings together a whole host of others on this thread alone alas are indicative of the depth of what was a great forum when Phil originally set it up, has sunk to. Whilst I'm not decrying "Burntfaceman's" impressive plethora of figures I can't help but think of a common saying during my working for a living days, that saying being, "There are lies, damn lies and statistics!" 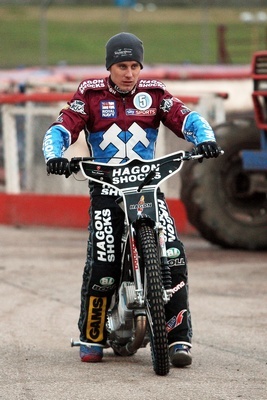 Jon Cook didn't make anything up OBaHB but with AJ contacting him and saying he was working hard (NOT had made a rapid recovery as you've posted) to try and get fit for both tonight's GP and Monday's 2nd leg at the NSS being very hopeful indeed of achieving that aim, what was he supposed to do? The situation is as stated by waihekeaces1 above - end of story! Don't know what the heck you are on about "jim3751" but you are totally and utterly wrong in your comment about where the track curator was on Wednesday. 5pm, NO Weather problems, gates open 6pm. Flipping quiet here as have had NO "is it on calls"
12.45pm WEATHER CHECK: Still fine, bright and sunnyl A quick reminder that it's a 7.30pm start tonight. 10am WEATHER CHECK Here just across the Thames from the track it's fine, bright and sunny and the Met Office say that we won't be getting any rain at all today so I don't expect to have to field many, if any, "Is tonight's meeting on cos it's chucking it down here," phone calls unless you're phoning from a tropical rainforest so come on down as someone used to say on the gogglebox! I understand tonight's programme also has a scorechart for you to fill in the results of the other match taking place at Poole with races from there being shown on a big screen at Arena Essex. Latest news on AJ at: http://www.speedwaygp.com/news/article/5235/aj-racing-on-eggshells but I don't think I'd do what he's doing even if I was battling to get my typing finger back working ok after injury!